Discounted admission after 7pm Sunday and all day Monday and Tuesday Please note - Insider price admissions are only available when booking in person at the box office. With £5 admission Sunday after 7pm and all day Monday and Tuesday, discounts on arts and events performances, plus food and drinks offers! Simply show your Insider card or temporary pass with every purchase. 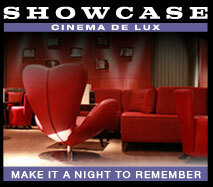 How to find Showcase cinema Teesside. The cinema is located at Teesside Leisure Park, adjacent to Teesside Retail Park at the Junction of the A19 & the A66, approximately half way between Middlesbrough and Stockton. As well as a digitally equipped cinema showing the finest global, independent and blockbuster films all in stunning high-definition. or shake your feathers in a cabaret party. Located in the town centre, Cineworld Middlesbrough boasts 11 screens with capacities ranging up to 400. All screens are air conditioned, with stadium seating and are equipped with great digital projection facilities. The cinema has a bar, and is served by a car park and great local transport links.